In Spring 2017, Dr. Richard Lathrop’s Advanced Environmental Geomatics class explored the Lower Raritan River from the R/V Rutgers. In addition to robust data collection and visualization, several of the students — Chris Wanter, Alexandria Ambrose, Steven Weber and Daryl Krusnuk — developed a story map examining the natural and cultural history of the Lower Raritan River. The story map begins at Landing Lane with a description of the colonial port that once thrived there and moves down river through a total of 20 sites to the swing bridge for NJ Transit’s North Jersey Coast Line. The Advanced Geomatics class also presented their course findings in a poster session at the 9th Annual Sustainable Raritan River Conference and Awards Ceremony in June. The story map is a great introduction to the lower reach of the river for anyone taking a tour by canoe, kayak or while conducting research from the R/V Rutgers! View the story map here! 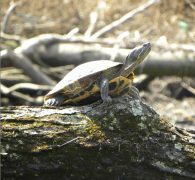 Photo of red-eared slider (Trachemys scripta elegans) by Steven Weber.